Did You Hear the Cries of Joy on September 12th in Bethany Ontario? Sometimes good news just has to be shared and shared. It seems that there are 2 very happy girls in Bethany these days. Twins Sophie and Josh came home to find a brand new swing and play structure in their backyard. The Million Dollar Smiles program became involved with fundraising for the play equipment when they learned of the deserving family. The program’s aim is to put a smile on the face of a child who has struggled with medical related challenges. Sophie knows medical complications all too well. At the age of 4 she suffers from hydrocephalus, which occurs when there’s been a build up of cerebrospinal fluid in the brain. According to the local newspaper, MyKawartha, Sophie has had four brain surgeries to help her cope with the condition and as she grows, she’ll need more surgeries to ensure the tube is long enough to allow the shunt to do its job. Sophie’s parents were told she might never walk or talk – but she is attending the Senior Kindergarten French Immersion program. The playground structure will be the perfect outlet for both children after a busy day at school! Byron John, with the Million Dollar Smiles program told reporters they partnered with Tim Horton’s and the Port Hope and Newcastle ONRoute locations. In all, roughly 30 volunteers helped to set it up. 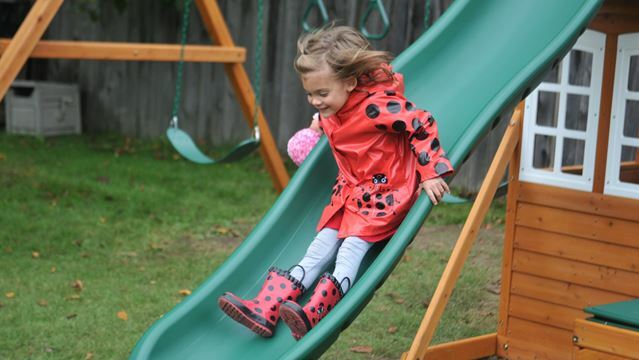 The backyard playground is more than just fun and physical activity for Sophie. It is safer for her to play in her own backyard due to her weakened immune system. Cries of joy are certainly music to Sophie and Josh’s parent’s ears!